Then this is the thing to bake. I've been running on fumes for the last 48 hours. 58 if you count the flight back to Los Angeles, and you should because getting a crick in your neck as you sleep upright really isn't sleep at all, and 82 if you count the minimal slumber from the night before as we tried to make our last night in Hong Kong count (and staying out until 5 or 6am is normal there). Surprisingly, I haven't been suffering from being wide awake at 4am like I would always be when I was younger. In fact, I've been sleeping way too much -- exhibit A being today's sudden realization that it was 9:17am, I should be at work at 9:45, but I still had to make this week's Tuesday's With Dorie pick by Lindsay of A Little Something...Sweet! 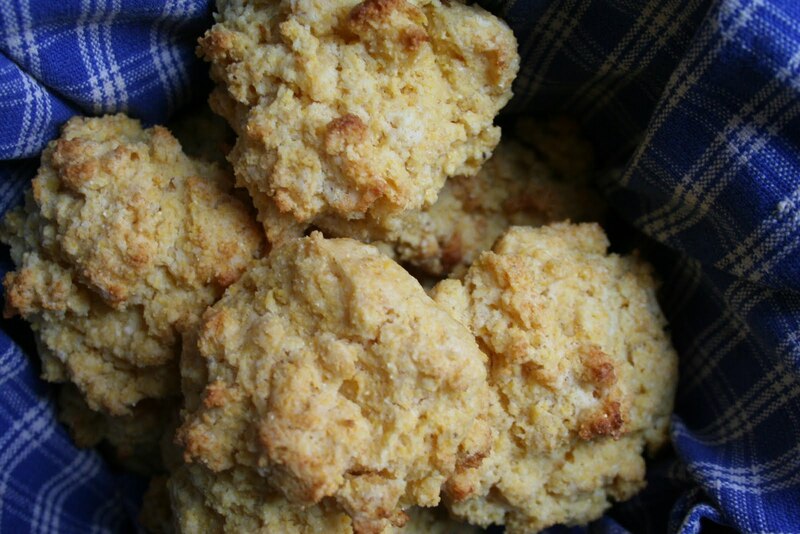 But these Maple Cornmeal Biscuits require none of the room-temperature eggs/milk/butter fuss that other baking recipes do. I simply rolled out of bed, preheated the oven, measured out the flour, cornmeal, baking powder, salt, and baking soda, waited for the oven to come to 425 degrees, and did that last minute cutting-in of the cold butter and incorporating of the milk and maple syrup before plopping the dough on a cookie sheet. It really was the simplest recipe. By the time the biscuits emerged from the oven, I was ready to go, and threw them in towel-lined basket as Dorie suggested they be eaten hot anyway. I got to work with the craggy, golden mounds still warm to the touch. With a quarter cup of maple syrup being the only sweetener in the recipe, the biscuits went perfectly with a bit of jam, though not at all necessary either. The cornmeal provided a wonderful texture and was another kick in the head as to its amazing properties in baked goods. Those lingering grains in the finish of a bite get me every time. Amazing you made these just as you came back from your trip! They were super simple and I liked the sweetness from the maple. I baked them too long but otherwise they were great! Hahaha...glad you had a good trip. I applaud you for making these. Thanks for baking along with me. sounds like a wonderful trip. Yes, quick and easy is perfect for a morning like that. I loved these. We ate them as breakfast for dinner. yours look yummy! What energy you've got! Three cheers for you for doing it all and doing it well. I bet you could have shown up even later for work, since you were bringing these in as a treat.